Since I was a teenager I dreamt of Italian summers and had the walls of my room covered in magazine pages of cliffside Italian towns. Sorrento is the starting point for most making their way along the Amalfi coast but shouldn't be dismissed as just a city to get to Positano. 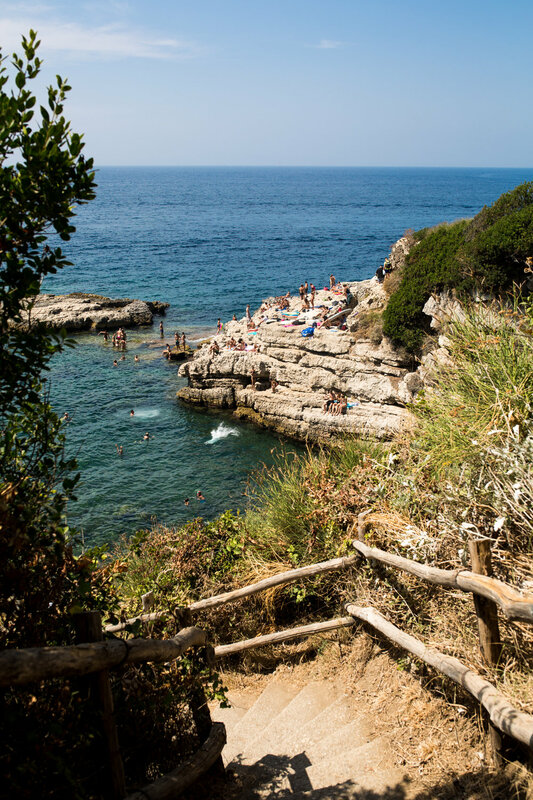 Here are a few spots for your quintessential Italian summer moments. When I travel I of course want to see the places that fill my Instagram and/or Pinterest feeds but am always looking for the experience that is a bit more off the beaten path. 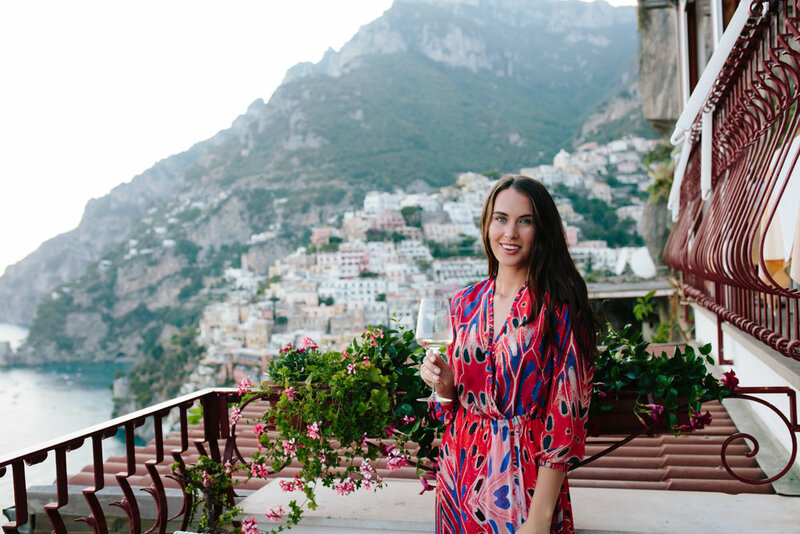 Luckily I was able to experience the best of both worlds during my time in Sorrento. 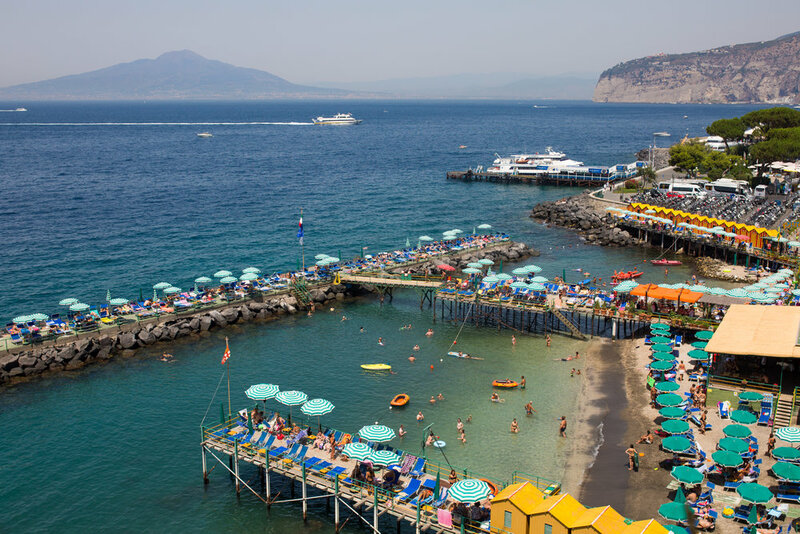 #1: The Sorrento spot you've heard of and are probably already planning on going to. Honestly, I still don't know what they call this area. Just look for the umbrellas! If you're looking for a place to lounge comfortably all day this is the place to be. 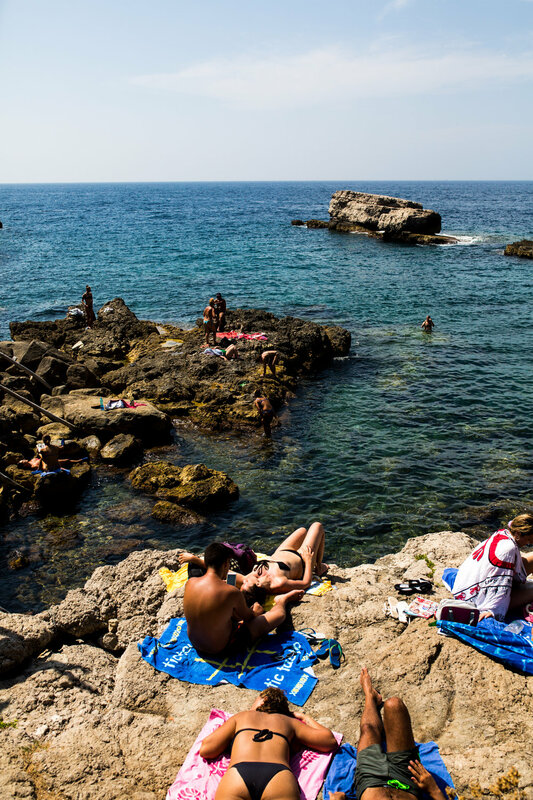 Situated below the Sorrento cliff you'll see piers of lounge chairs and colorful parasols. There are multiple restaurants and bars, each with their own area or chairs, umbrellas, changing areas and all at different prices. I decided to get a lounge chair at Leonelli's Beach which only cost about 6 Euro. I got there pretty early so I was able to pick a chair close to a spot where you can get into the water. The later you decide to arrive of course, the less options that you'll have. Leonelli's also offers umbrellas, changing rooms and also has a restaurant and cafe. I don't know the policy on food but they must not be that strict because I saw entire families sharing home cooked meals so if you plan ahead you can probably get away with taking your own food and saving money. Besides that, I don't have much to share because I pretty much sunbathed, got into the water, ate and REPEAT for a good couple of hours until I felt my skin turning a color similar to Italian leather! Oh yeah and I got whistled at (not the cat call kinda whistle), like the "get down from rocky cliff you're climbing up to get a photo" kinda whistle. Thankfully, I had already gotten one shot and then spoke to the man that whistled at me and told him I wasn't going any higher than the makeshift stairs that were leading up the cliff and he let me take a few more shots! Phew, because unique angles and perspectives of spots that are photographed often are key! Oh yes and eat a lot of gelato! #2: The Sorrento spot you probably haven't heard of, was recommended by a local and the place you opted to visit instead of Capri. Name: Bagni Regina Giovanna. While eating pizza in town, a waiter of the restaurant, recommended we visit this beach spot, Bagni Regina Giovanna. It was a Saturday and we were planning on visiting Capri the next day but after talking to him and hearing how crowded and busy it is, not only on Sunday but also during peak season, we decided to check out this local spot instead. I don't really have regrets when I don't see certain places because I always have a feeling I'll be back again someday. We met through this Facebook group, Girls Love Travel. Veronica is a travel blogger and when she was in LA she posted in the group looking for a photographer so we met in LA. Then we decided to travel to Italy together. Most people were in awe because we met through Facebook and not everyone understood the entire blogging concept but it was always fun because we knew what to expect when we started conversation with new people. She's also the one I have to thank for taking photos of me! Veronica in Positano! Usually travel solo but it's always nice having someone to put sunscreen on your back and take photos of you! Anyways before we made our way to Bagni Regina Giovanna the next day I wanted to buy some snacks since I was pretty certain there wouldn't be anything there. In Italy, a favorite of mine were the parma ham sandwiches with tomato and mozzarella and we found a shop that sold sandwiches and I ordered one to "take away". I must have been in a cheeky mood because I asked the Italian man if he could add pesto to my sandwich; mostly because I know Italians don't like to alter their foods and I wanted to see his response. Immediately in his very Italian accent he said, "no, no pesto. pesto is for pasta". Okay fine, no pesto, he obviously hadn't tried a chicken pesto sandwich! Even when my sandwich was done I joked, "this has pesto right?". He knew I was joking but he still walked off saying "pesto is for pasta" and concluding with some other Italian mumblings, probably cursing me. So for the rest of the trip I would randomly repeat in my Italian accent, "pesto is for pasta". Veronica was officially over it by the end of the trip but I'll do it for you all when I get home. Me with my pesto-less sandwich! Bagni Regina Giovanna, like most places worth getting to, was a long walk and even longer and steeper walk back up. 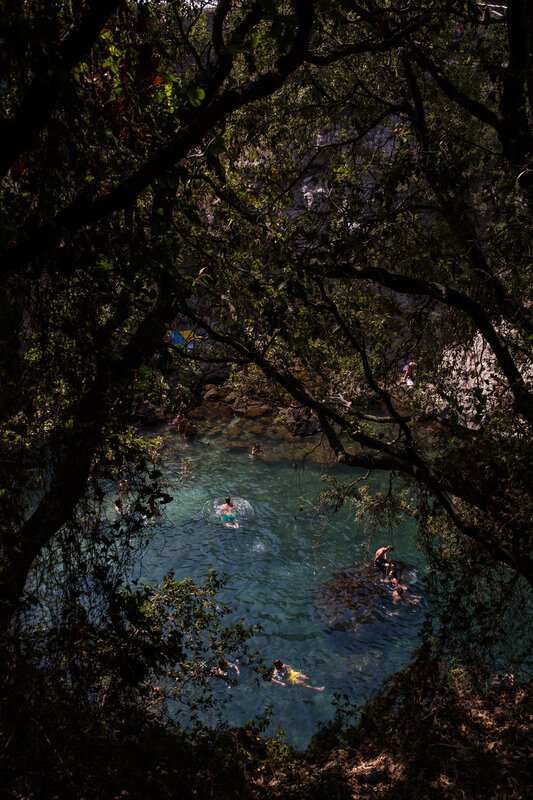 The water was clear and a perfect shade of greenish-blue. A word of warning for those visiting Mediterranean beaches, don't expect fine sandy beaches, instead expect a lot of rocks. This spot was difficult to navigate as there's not much flat space to lay but if you're lucky like me you'll find a rock suited for your curves. A sweet Italian man was in the spot before me but ended up leaving and offered it to me. I felt like a mermaid perched on the best rock on the beach! After a few hours of lounging here, Veronica and I decided to explore further as we couldn't exactly find a way down to the Bagni, meaning "bath", area. By the time we got there the spot was filled and not much space to layout either so I just decided to hope in for a quick swim and explore the cave that then eventually leads to the ocean. I'm so glad I brought my GoPro because I got some beautiful footage of the light rays underwater. This spot is definetly for the more adventurous and if I didn't take my camera with me I probably would have swam to the ocean side. It's definetly worth the effort to find this spot and get down to it as I feel like I see photos of places like this and only dream of visiting there "someday". This was one of the best beach spots I've ever been to and even more so since it was a spot recommended and obviously frequented by locals! Found it! Bagni Regina Giovanna.